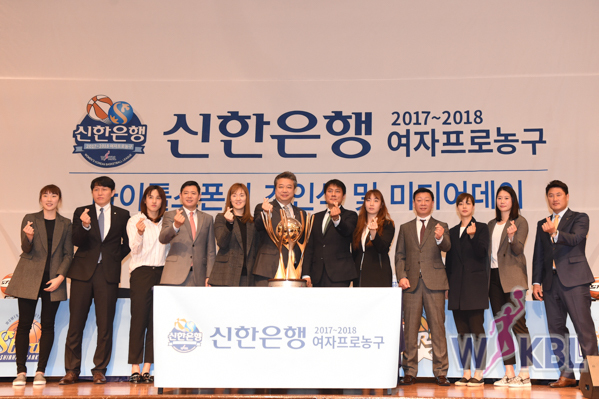 The WKBL will kick of their 2017-2018 campaign on Saturday with several teams ready to challenge reigning five time champions Woori Bank. There are a lot of new foreign faces competing this season with a few returners. Woori Bank, who has won the last five titles in the WKBL are still the team to beat. Unfortunately for Woori, they’ve had to make changes to their foreign players. Initially Woori Bank drafted Tianna Hawkins of the Washington Mystics and Shekinna Strickland of the Connecticut Sun. Hawkins never arrived in Korea after suffering an injury during the season that needed to be rehabbed. Strickland was only in Korea for about a week when she suffered an injury that forced her to head back home. Woori replaced Hawkins with Natalie Achonwa from the Indiana Fever. They also brought in Aisha Sutherland who most recently played in Spain to replace Strickland. Despite having to make last minute roster changes, Woori Bank are still the favorites. Samsung who were the runner ups last season brought back their star player Alyssa Thomas. Last season was the first year that teams could resign one of the two foreign players on their rosters and Samsung was the only team to do so. Woori Bank attempted to resign Jonquel Jones who was named MVP of the league but she declined and is now playing in China. Samsung also drafted Kayla Alexander of the San Antonio Stars. Samsung is thought to be one of the challengers for the title this season. KBD who finished at the bottom of the league last season boosted their roster with Jewel Loyd of the Seattle Storm and Chante Black who had a short stint in the WNBA with the Tulsa Shock. KEB HANA also have new foreign players on board. They had the first pick in the 2017 WKBL draft which they used to select Isabelle Harrison of the San Antonio Stars. They also drafted Jazmon Gwathmy of the Indiana Fever. Shinhan Bank drafted Kayla Thornton of the Dallas Wings, who played in the Korean League last season and Rashonda Gray. KB Bank is another team that could possibly win the WKBL championship this season. After a late season run that put them in the playoffs last season, KB is looking for revenge. They drafted Phoenix Mercury’s Monique Currie who has made quite the career playing in Korea. This will be her fifth season playing in the WKBL. Alongside Currie will be Damiris Dantas of the Atlanta Dream, who is playing in Korea for the first time. Many think KB Bank will be a challenge at the top because of their rookie sensation Ji Soo. Ji Soo was drafted last season and immediately made an impact. She is the tallest Korean player in the league at 6’5” and has already proven to be a player the world should be watching. Stay tuned as we keep you updated on the happenings of the Korean League!